It’s rare that a data analysis involves only a single table of data. Typically you have many tables of data, and you must combine them to answer the questions that you’re interested in. Collectively, multiple tables of data are called relational data because it is the relations, not just the individual datasets, that are important. Relations are always defined between a pair of tables. All other relations are built up from this simple idea: the relations of three or more tables are always a property of the relations between each pair. Sometimes both elements of a pair can be the same table! This is needed if, for example, you have a table of people, and each person has a reference to their parents. Mutating joins, which add new variables to one data frame from matching observations in another. 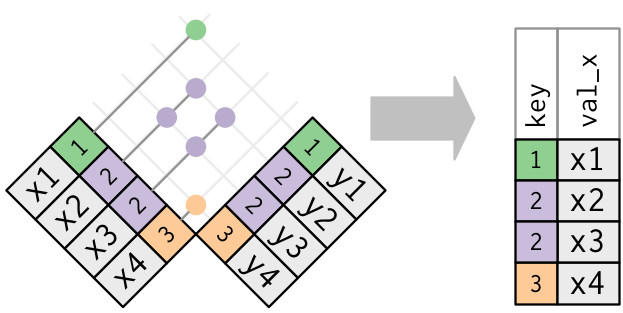 Filtering joins, which filter observations from one data frame based on whether or not they match an observation in the other table. Set operations, which treat observations as if they were set elements. The most common place to find relational data is in a relational database management system (or RDBMS), a term that encompasses almost all modern databases. If you’ve used a database before, you’ve almost certainly used SQL. If so, you should find the concepts in this chapter familiar, although their expression in dplyr is a little different. Generally, dplyr is a little easier to use than SQL because dplyr is specialised to do data analysis: it makes common data analysis operations easier, at the expense of making it more difficult to do other things that aren’t commonly needed for data analysis. We will explore relational data from nycflights13 using the two-table verbs from dplyr. #> 1 9E      Endeavor Air Inc.
#> 2 AA      American Airlines Inc.
#> 3 AS      Alaska Airlines Inc.
#> 5 DL      Delta Air Lines Inc.
#> 6 EV      ExpressJet Airlines Inc. This diagram is a little overwhelming, but it’s simple compared to some you’ll see in the wild! The key to understanding diagrams like this is to remember each relation always concerns a pair of tables. You don’t need to understand the whole thing; you just need to understand the chain of relations between the tables that you are interested in. flights connects to planes via a single variable, tailnum. flights connects to airlines through the carrier variable. flights connects to airports in two ways: via the origin and dest variables. flights connects to weather via origin (the location), and year, month, day and hour (the time). Imagine you wanted to draw (approximately) the route each plane flies from its origin to its destination. What variables would you need? What tables would you need to combine? I forgot to draw the relationship between weather and airports. What is the relationship and how should it appear in the diagram? weather only contains information for the origin (NYC) airports. If it contained weather records for all airports in the USA, what additional relation would it define with flights? We know that some days of the year are “special”, and fewer people than usual fly on them. How might you represent that data as a data frame? What would be the primary keys of that table? How would it connect to the existing tables? The variables used to connect each pair of tables are called keys. A key is a variable (or set of variables) that uniquely identifies an observation. In simple cases, a single variable is sufficient to identify an observation. For example, each plane is uniquely identified by its tailnum. In other cases, multiple variables may be needed. For example, to identify an observation in weather you need five variables: year, month, day, hour, and origin. 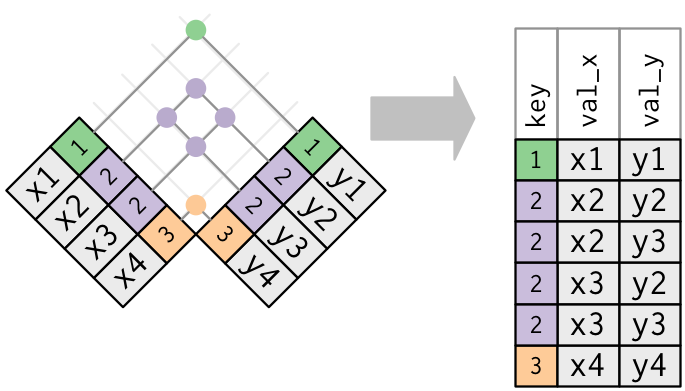 A primary key uniquely identifies an observation in its own table. 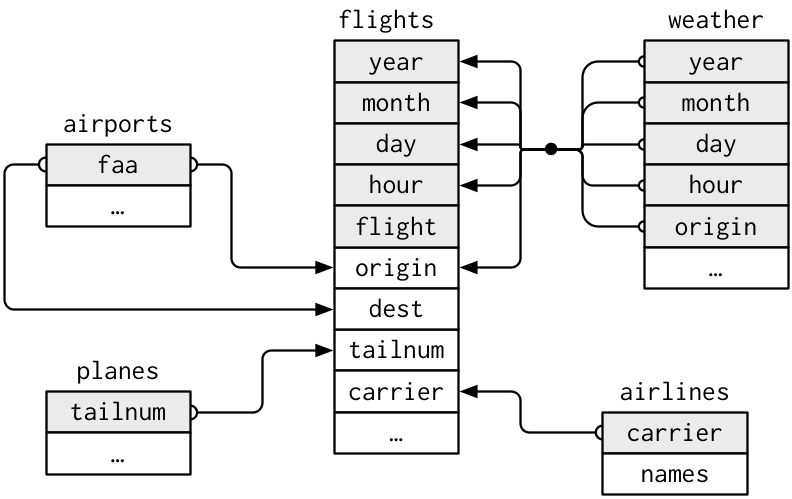 For example, planes$tailnum is a primary key because it uniquely identifies each plane in the planes table. 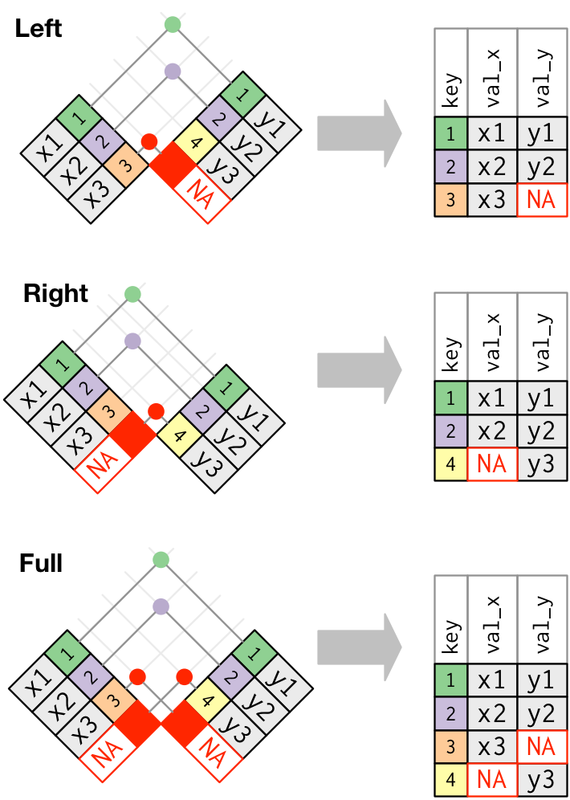 A foreign key uniquely identifies an observation in another table. For example, the flights$tailnum is a foreign key because it appears in the flights table where it matches each flight to a unique plane. A variable can be both a primary key and a foreign key. For example, origin is part of the weather primary key, and is also a foreign key for the airport table. When starting to work with this data, I had naively assumed that each flight number would be only used once per day: that would make it much easier to communicate problems with a specific flight. Unfortunately that is not the case! If a table lacks a primary key, it’s sometimes useful to add one with mutate() and row_number(). That makes it easier to match observations if you’ve done some filtering and want to check back in with the original data. This is called a surrogate key. A primary key and the corresponding foreign key in another table form a relation. Relations are typically one-to-many. For example, each flight has one plane, but each plane has many flights. In other data, you’ll occasionally see a 1-to-1 relationship. You can think of this as a special case of 1-to-many. You can model many-to-many relations with a many-to-1 relation plus a 1-to-many relation. For example, in this data there’s a many-to-many relationship between airlines and airports: each airline flies to many airports; each airport hosts many airlines. Add a surrogate key to flights. Draw a diagram illustrating the connections between the Batting, Master, and Salaries tables in the Lahman package. Draw another diagram that shows the relationship between Master, Managers, AwardsManagers. How would you characterise the relationship between the Batting, Pitching, and Fielding tables? The first tool we’ll look at for combining a pair of tables is the mutating join. A mutating join allows you to combine variables from two tables. It first matches observations by their keys, then copies across variables from one table to the other. #> 1  2013     1     1     5 N14228  UA      United Air Lines Inc.
#> 2  2013     1     1     5 N24211  UA      United Air Lines Inc.
#> 3  2013     1     1     5 N619AA  AA      American Airlines Inc.
#> 5  2013     1     1     6 N668DN  DL      Delta Air Lines Inc.
#> 6  2013     1     1     5 N39463  UA      United Air Lines Inc. But this is hard to generalise when you need to match multiple variables, and takes close reading to figure out the overall intent. The following sections explain, in detail, how mutating joins work. You’ll start by learning a useful visual representation of joins. We’ll then use that to explain the four mutating join functions: the inner join, and the three outer joins. When working with real data, keys don’t always uniquely identify observations, so next we’ll talk about what happens when there isn’t a unique match. Finally, you’ll learn how to tell dplyr which variables are the keys for a given join. The coloured column represents the “key” variable: these are used to match the rows between the tables. The grey column represents the “value” column that is carried along for the ride. In these examples I’ll show a single key variable, but the idea generalises in a straightforward way to multiple keys and multiple values. 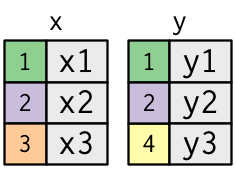 A join is a way of connecting each row in x to zero, one, or more rows in y. The following diagram shows each potential match as an intersection of a pair of lines. In an actual join, matches will be indicated with dots. The number of dots = the number of matches = the number of rows in the output. The most important property of an inner join is that unmatched rows are not included in the result. This means that generally inner joins are usually not appropriate for use in analysis because it’s too easy to lose observations. A left join keeps all observations in x. A right join keeps all observations in y. 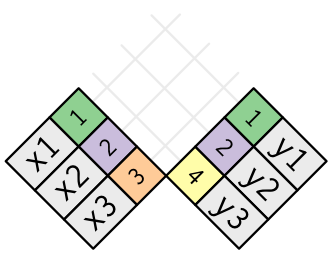 A full join keeps all observations in x and y. These joins work by adding an additional “virtual” observation to each table. This observation has a key that always matches (if no other key matches), and a value filled with NA. The most commonly used join is the left join: you use this whenever you look up additional data from another table, because it preserves the original observations even when there isn’t a match. The left join should be your default join: use it unless you have a strong reason to prefer one of the others. However, this is not a great representation. It might jog your memory about which join preserves the observations in which table, but it suffers from a major limitation: a Venn diagram can’t show what happens when keys don’t uniquely identify an observation. One table has duplicate keys. This is useful when you want to add in additional information as there is typically a one-to-many relationship. Note that I’ve put the key column in a slightly different position in the output. This reflects that the key is a primary key in y and a foreign key in x. The default, by = NULL, uses all variables that appear in both tables, the so called natural join. For example, the flights and weather tables match on their common variables: year, month, day, hour and origin. A character vector, by = "x". This is like a natural join, but uses only some of the common variables. For example, flights and planes have year variables, but they mean different things so we only want to join by tailnum. Note that the year variables (which appear in both input data frames, but are not constrained to be equal) are disambiguated in the output with a suffix. A named character vector: by = c("a" = "b"). This will match variable a in table x to variable b in table y. The variables from x will be used in the output. You might want to use the size or colour of the points to display the average delay for each airport. Add the location of the origin and destination (i.e. the lat and lon) to flights. Is there a relationship between the age of a plane and its delays? What weather conditions make it more likely to see a delay? What happened on June 13 2013? Display the spatial pattern of delays, and then use Google to cross-reference with the weather. The advantages of the specific dplyr verbs is that they more clearly convey the intent of your code: the difference between the joins is really important but concealed in the arguments of merge(). dplyr’s joins are considerably faster and don’t mess with the order of the rows. Note that “INNER” and “OUTER” are optional, and often omitted. Joining different variables between the tables, e.g. inner_join(x, y, by = c("a" = "b")) uses a slightly different syntax in SQL: SELECT * FROM x INNER JOIN y ON x.a = y.b. As this syntax suggests, SQL supports a wider range of join types than dplyr because you can connect the tables using constraints other than equality (sometimes called non-equijoins). But it’s difficult to extend that approach to multiple variables. For example, imagine that you’d found the 10 days with highest average delays. How would you construct the filter statement that used year, month, and day to match it back to flights? #> Joining, by = "dest"
Filter flights to only show flights with planes that have flown at least 100 flights. Combine fueleconomy::vehicles and fueleconomy::common to find only the records for the most common models. Find the 48 hours (over the course of the whole year) that have the worst delays. Cross-reference it with the weather data. Can you see any patterns? What does anti_join(flights, airports, by = c("dest" = "faa")) tell you? What does anti_join(airports, flights, by = c("faa" = "dest")) tell you? You might expect that there’s an implicit relationship between plane and airline, because each plane is flown by a single airline. Confirm or reject this hypothesis using the tools you’ve learned above. The data you’ve been working with in this chapter has been cleaned up so that you’ll have as few problems as possible. Your own data is unlikely to be so nice, so there are a few things that you should do with your own data to make your joins go smoothly. Start by identifying the variables that form the primary key in each table. You should usually do this based on your understanding of the data, not empirically by looking for a combination of variables that give a unique identifier. If you just look for variables without thinking about what they mean, you might get (un)lucky and find a combination that’s unique in your current data but the relationship might not be true in general. For example, the altitude and longitude uniquely identify each airport, but they are not good identifiers! Check that none of the variables in the primary key are missing. If a value is missing then it can’t identify an observation! Check that your foreign keys match primary keys in another table. The best way to do this is with an anti_join(). It’s common for keys not to match because of data entry errors. Fixing these is often a lot of work. If you do have missing keys, you’ll need to be thoughtful about your use of inner vs. outer joins, carefully considering whether or not you want to drop rows that don’t have a match. Be aware that simply checking the number of rows before and after the join is not sufficient to ensure that your join has gone smoothly. If you have an inner join with duplicate keys in both tables, you might get unlucky as the number of dropped rows might exactly equal the number of duplicated rows! intersect(x, y): return only observations in both x and y.
union(x, y): return unique observations in x and y.